In Africa there’s a place “where men should not go” because they’re going to get lost. I’m a woman, it should be ok for me then! 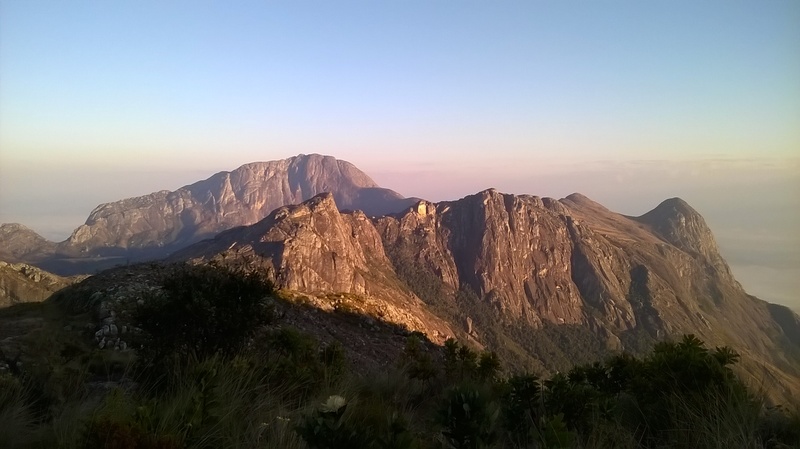 Sapitwa peak is highest point in South-Central Africa and one of the most mystical place in Malawi. 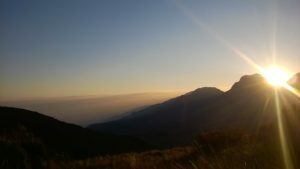 A 3-days trek is the perfect way to enjoy and explore the Mount Mulanje mainly because your feet are the only means of transportation capable to get you to its summit, Sapitwa. If you don’t want to get lost and become the subject of the next Mulanje legend, hire a guide. In Malawi’s Sothern Region, Mount Mulanje rises very sharply above the surrounding Phalombe Plain which lies about 700m above the sea level. It is a huge, isolated massif with 20 peaks rising out of a plateau and the Sapitwa peak reaches a towering 3002m. 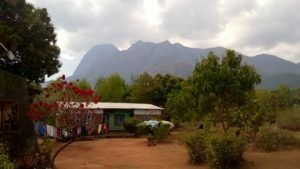 I arrived to Mulanje town by a crowded mini-bus from Blantyre, Malawi’s second-largest city, on about 70km of a quite good road, and I went directly to the infoMulanje Tourist Office to find information about the trek and a guide. The office is very strategically located above the Mulanje Pepper Pizzeria, where you can enjoy a rewarding meal after the trek. Victor gave me all the information I needed and he accepted to be my guide, despite my excellent bargain competences. I chose the 3-days trek to visit the area because it’s a good compromise between the 1-day trek that doesn’t allow you to climb up to the Sapitwa peak and the 5-days trek that risk to make your backpack too much heavy or need a porter. On the mountain you’ll find well equipped hut along the different trails, but you need to bring with you all the food that you’re going to eat during the trek. For the night a sleeping bag is enough as mattresses are available in the hut, and don’t forget some warm clothes, after the sunset temperature drops down below 10–5°C. The Boma path, starting at less than a kilometer from the nice Mulanje View Hotel in Mulanje town, is the most accessible route onto Mount Mulanje’s uplands, but the final ascent is extremely steep and should not be hiked if it is wet. The path begins by twisting along the edge of Chitakale Estate with wonderful views across the tea fields and then 3 hours of excruciating ascent begins. Be prepared to face “the wall”! It will be a great opportunity to get used to scramble and to know better your best friends of the trek: the rocks, the tufts of grass and the hand of your guide. At the top of the wall you’ll find the Lichenya Plateau and, after an easy promenade, a very nice and peaceful hut. The following day you will reach quite easily the Chisepo hut and from there Sapitwa peak it’s just 2 hours away. 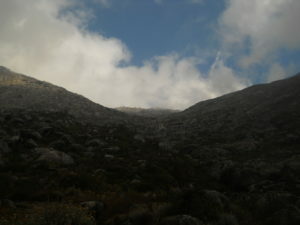 The path climbs upwards through bush and stones to reach steep rock slabs. It’s hard, but if you already survived at “the wall”, you can do that! After scrambling, jumping, squeezing between huge rock slabs, you’ll reach the Sapitwa peak. When I finally touched the 3002m sign, we were in the clouds. 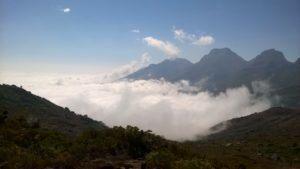 There was absolutely no view but it was an extremely rewarding summit for me and being in the thick mist I really felt like I was going to live one of the Sapitwa legends…. Various legendary creatures are believed to live on Sapitwa peak. One of them is Napolo. Napolo is a flying serpent who floats around creating the blanket of nebulous mist that envelops the upper slopes and sometimes confuses climbers. I don’t know if it was him but if I were up there in the clouds without my guide I would definitely have lost my way back to the hut! Other mountain spirits are weird but quite generous. They leave bananas and other meals on the summits to help exhausted travelers and they kidnap those who refuse their offerings. If you find I banana on your way, I suggest you eat it even if you don’t believe in stories like this, you’ll need energy anyway! These are legends but unfortunately under legends usually lays real facts. Not far from the sign marking the summit, you will find a sign in memory of the last person who didn’t come back from Mulanje mountain: a Brazilian student who went missing while hiking alone on the Sapitwa. The return to Chisepo hut is along the same route, it’s steep so you’re allowed to use the “slide method” if, like in my case, the descent scares you. The last day of hike, a pretty long but scenic path will take you back to Mulanje town. I dared to go up there where it’s easy to get lost but Sapitwa’s spirits let me go back home. It’s your turn to reach the top now: follow your guide, eat the free food and everything will be fine!